News Photo by Jonny Zawacki Alpena’s Mija Pilkaite lunges for a ball during a No. 1 doubles tennis match against Grayling on Monday at the APlex in Alpena. Pilkaite and partner Taylor Belanger were victorious, winning by scores of 6-3 and 6-2. 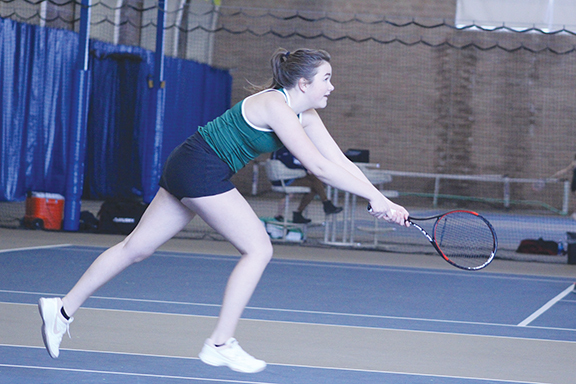 For the second time in as many contests, the Alpena High girls tennis team earned was victorious with a 7-1 home win over Grayling on Monday at the APlex. The Wildcats looked sharp and showed improvements from their first time out last week, which also resulted in a victory. 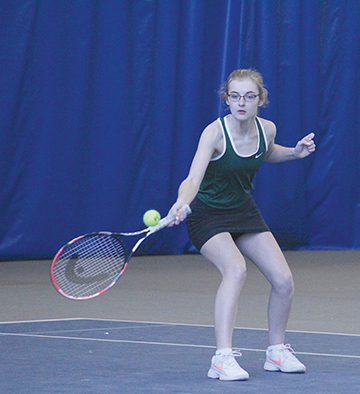 The Alpena doubles teams earned a clean sweep over the Vikings, as the four Wildcat teams put together strong performances all around. Taylor Belanger and Mija Pilkaite defeated Megan Benson and Ellie Wagner 6-3, 6-2 at No. 1 doubles. News Photo by Jonny Zawacki Alpena’s Danielle Schackmann returns a volley during a No. 4 doubles match on Monday. Schackmann and Tayler Hansen Bates won by scores of 6-2 and 6-1 as the Wildcats defeated Grayling 7-1 on Monday. The No. 2 doubles team of Rachel Hart and Arlene Dai shut out Jasmine Dannenberg and Natalie Do 6-0, 6-0. Amelia Berles and Tilly Williams also picked up a shutout at No. 3 doubles, cruising past Zoe Padgett and Annie Hill 6-0, 6-0. The No. 4 doubles team of Taylor Hansen Bates and Danielle Schackmann defeated Joslynn Rennie and Ally Laine 6-2, 6-1 to round off the solid night for Alpena doubles teams. The Alpena singles competitors did their part in the winning effort as Gwynevere Denbleyker knocked off Christina Gilkerson 6-0, 6-1 at No. 1 singles. Brynna Smith shut out Natalie Anderson 6-0, 6-0 at No. 2 singles and Emeline Hanna defeated Madison Hehir 6-3, 1-6, 10-5 in at competitive No. 3 singles match. “It’s really important for the girls to keep gaining this confidence. It’s important to be able to make adjustments and correct things that we have been working on in practice,” Giordano said. “We’re quite a bit stronger than we were last year, but the competition is going to keep getting better and better so we don’t know what will happen over the next few weeks, but we don’t worry about the results, we worry about our own play and improving, but it is definitely important to build this confidence early.